Thomas William Clements was born at Walsoken, Norfolk, in 1837 although on later census returns he would claim Wisbech, Cambridgeshire and Yeovil as his place of birth - Walsoken being just over a mile from Wisbech and both being on the county boundary. He was the son of agricultural labourer Mark Clements and his wife Alice. The 1841 census listed Thomas with his parents and three siblings at Walsoken. 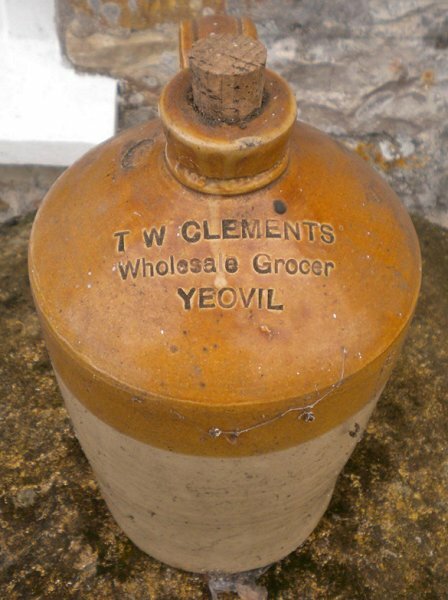 By 1861 25-year old Thomas was living and working as a grocer's assistant in Edwin Gregory's grocery shop in High Street, Street. On 4 June 1863, at the Independent Chapel, Wells, he married Emily Petvin of Street, the daughter of Joseph Petvin and his wife Elizabeth. 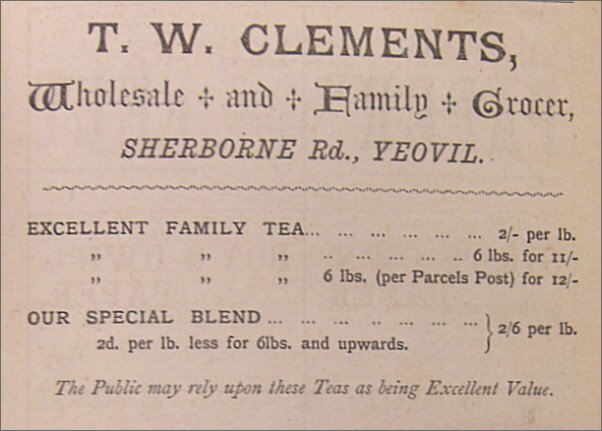 After their marriage Thomas and Emily moved to Yeovil where, in 1863, Thomas established his own grocery business on the corner of Sherborne Road and Wyndham Street and in the 1866 edition of the Post Office Directory he was listed as 'Thomas W Clements, Grocer of Town's End'. Thomas and Emily were to have four children; Sidney born 1863, Frank born 1864, Frederick born 1867 and Arthur born 1868. In the 1871 census Thomas, Emily and the four boys, together with two shop assistants, a grocer's apprentice and a general servant were living above the shop. Thomas gave his occupation as 'Grocer, employing 3 men & 2 boys'. In the spring of 1877 Emily died at Yeovil, aged 38, and in the autumn of 1880 Thomas married Louisa Octavia Chapman at Yeovil. Louisa was the youngest daughter of dissenting minister Joseph Chapman and his wife Mary, of Rotten Row (today's Market Street). The 1881 census listed Thomas and Louisa at 9 Wyndham Street (next door to the grocery shop at 10 Wyndham Street) with Frank, Arthur and Sidney from his first marriage, and Thomas and Louisa's son, five-year-old Percy Albert. By 1889 Thomas had opened a branch shop at Alma House in High Street, next door to the Fleur de Lys public house and opposite the Mermaid Hotel. It had previously been the premises of draper Benjamin Penny. In Whitby's Yeovil Almanack Advertiser of 1889 he was listed as 'TW Clements, Grocer of Sherborne Road' with a separate advertisement for 22 High Street. The 1891 Census was similar, with the shop at 10 and the family living at 9 Wyndham Street. 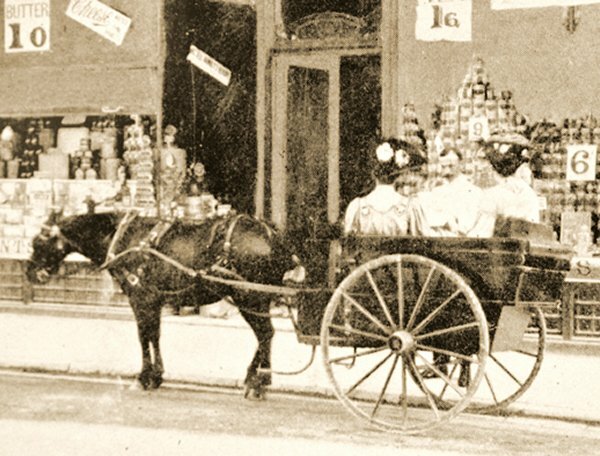 Thomas listed his occupation as Provision Merchant and the two boys still living at home; Frank, aged 29 and Frederick, aged 24, gave their occupation as Grocer's Manager and Traveller in Groceries, respectively. Whitby's Yeovil Almanack Advertiser of 1895 listed Thomas as a Grocer of Sherborne Road and separately as a Grocer of the 'Town & County Stores' at 22 High Street. By 1901 Thomas and Louisa, together with a domestic servant, were living at 'Lyncroft', The Park, next door to glove manufacturer Herbert Southcombe and mayor of Yeovil from 1889 to 1890, who had been their neighbour in Wyndham Street, some 20 years earlier. Thomas listed his occupation as Provisions Merchant. 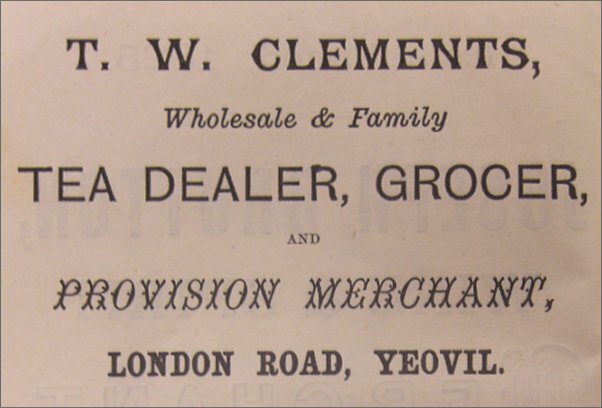 From 1903 trade directories were listing Clements & Sons, Grocers, in separate advertisements for both premises. 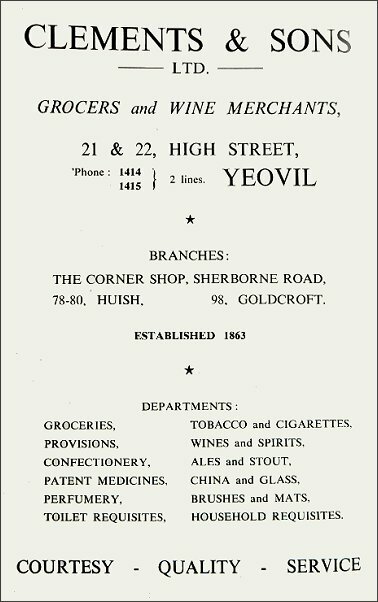 Collin's Yeovil Directory of 1907 ran an advertisement for each of the stores as 'Grocer & Provisions Dealer' but also had a second listing for the High Street store as 'Wine & Spirits Merchants'. 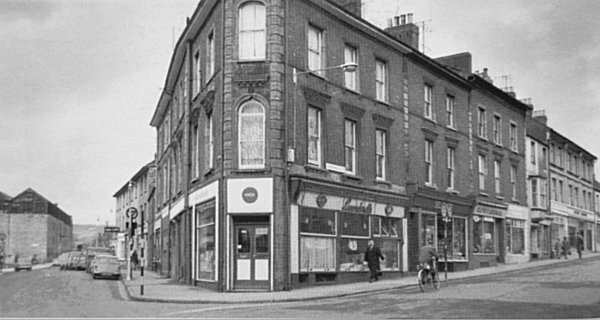 Frederick, meanwhile, was running the shop in Sherborne Road / Wyndham Street while he, his wife Flora and their daughter Winifred, together with a servant, lived at 5 Wyndham Street. In May 1928, at the age of 61, Frederick left England via Liverpool and sailed to America, arriving in Boston, Massachusetts, on 10 June 1928. Frank, in 1901, was living above the High Street shop with his wife Gertrude, daughter Beryl and a servant. He gave his occupation as Grocer & Provision Merchant. 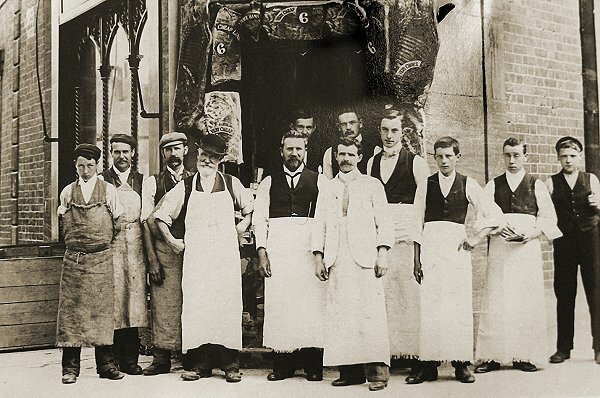 It was really Frank who, during the first half of the twentieth century, built up the business of Clement & Sons. He took over the neighbouring Fleur de Lys building when the public house closed in the late 1930s or early 1940s. By 1935 the company was known as Clements & Sons Ltd with listings in Kelly's Directory as 'Wine & spirits Merchants of Wyndham Street' and 'Grocer, Tea, Wine & Spirits Dealer of High Street'. 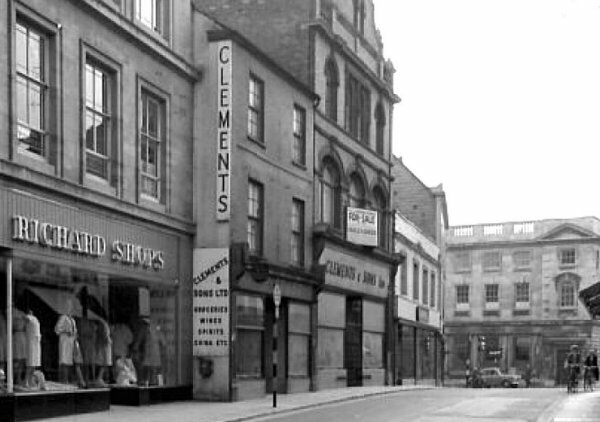 All the Clements' shops remained open until the 1960s. Thomas Clements died in 1929 at the age of 93. His son, Frank Clements, died in 1962 aged 78. Advertisement in Whitby's Yeovil Almanack Advertiser of 1879. An 1884 advertisement in Whitby's Yeovil Almanack Advertiser. 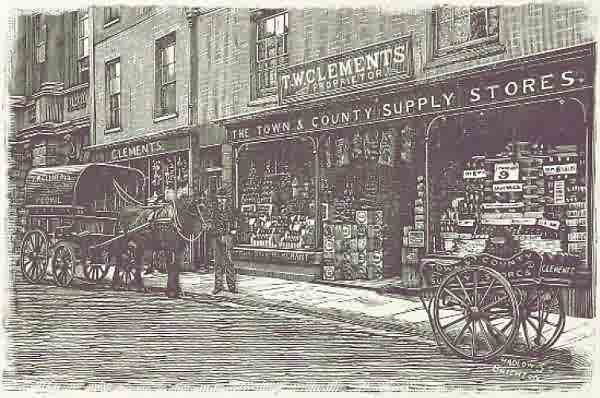 An illustration of Thomas Clements' Town & Country Supply Stores in High Street (where Argos is today) from the 1891 edition of 'Where to Buy'. Notice, at extreme top left the adjacent Town Hall. 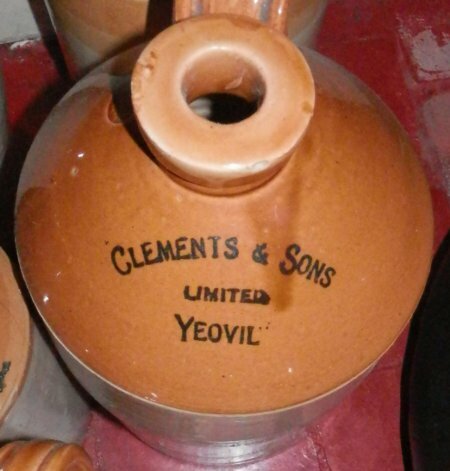 A cider jug stamped with TW Clements and probably dating to around 1900 before the business became Clements & Son. .... and a later example from after the sons had joined the firm. The staff of Thomas Clements' store on the corner of Wyndham Street and Sherborne Road gather for a group photograph around 1890. 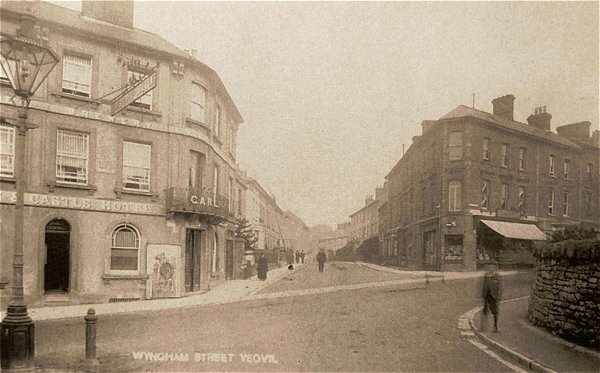 This postcard of Wyndham Street is seen from the junction of Newton Road with Lower Middle Street around 1900. Thomas Clements' shop is at right with the awning, opposite the Elephant & Castle. Note the Sugg lamp at extreme left and at extreme right the stone wall where the boy is standing is now the old Western Gazette offices, built in 1906. 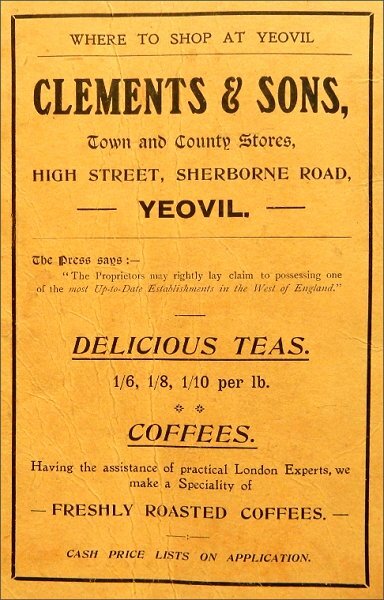 A Clements & Sons' advertisement dating to 1906 by which time they had the large High Street premises in addition to those at Sherborne Road. 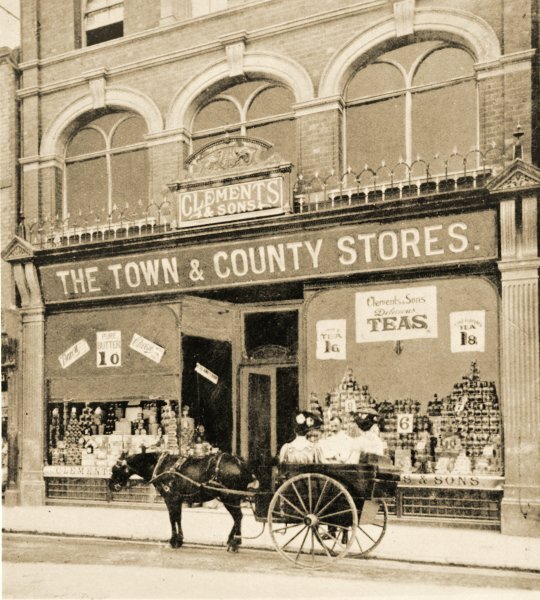 Clement's shop in High Street, photographed around 1900. Now that's what I call service - in an enlargement of the previous photograph an assistant brings out the ladies' shopping to their pony & trap. An advertisement for Clements & Sons Ltd from 1928. 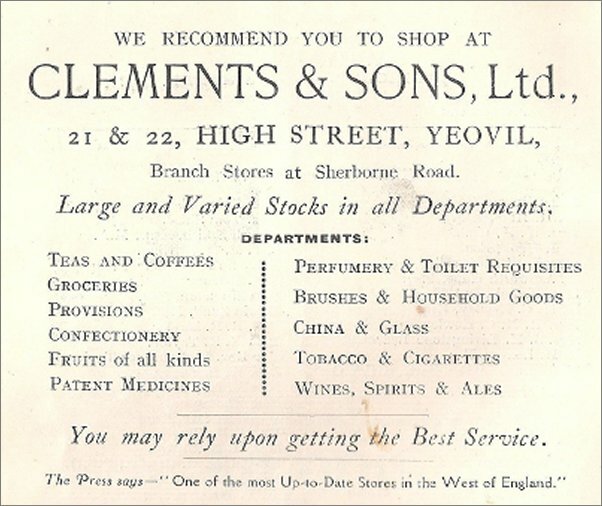 Clements & Sons' advertisement in the 1953 Yeovil Guide. 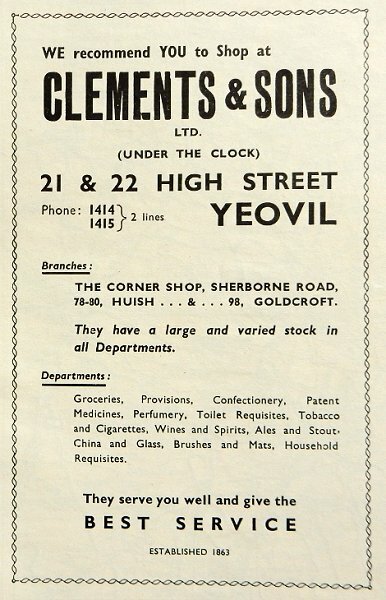 Clements & Sons' advertisement in the 1961 Yeovil Rural District Official Guide. After Frank's death in 1962 the Sherborne Road shop was sold and became a launderette as seen in this photograph of the mid-1960s.